We report on UV laser photoresist mask writing as a tool for fabricating integrated optical waveguides and devices. Using 375 nm laser light and a pneumatically controlled direct writing stage, we defined mask features into a 250-nm-thick negative photoresist layer on a silicon nitride film on an oxidized silicon substrate. We investigated the feature size and edge roughness for different laser powers. Using the photoresist mask layer and reactive ion etching, we patterned high-refractive-index-contrast silicon nitride strip waveguides and devices with varying waveguide widths and gaps. We report on the structural and transmission characteristics of a directional coupler, Sagnac interferometer, and ring resonator and demonstrate 50/50 coupling at 1510 nm, 20 dB transmission drop at 1580 nm, and a Q factor of ∼13,000 at 1576 nm, respectively. These results demonstrate that this technique can be applied to a variety of thin film materials and substrates for inexpensive and rapid prototyping of integrated photonic devices. R. R. Gattass and E. Mazur, “Femtosecond laser micromachining in transparent materials,” Nat. Photonics 2(4), 219–225 (2008). Y. Huang, G. T. Paloczi, A. Yariv, C. Zhang, and L. R. Dalton, “Fabrication and replication of polymer integrated optical devices using electron-beam lithography and soft lithography,” J. Phys. Chem. B 108(25), 8606–8613 (2004). T. Barwicz, M. A. Popovic, P. T. Rakich, M. R. Watts, H. A. Haus, E. P. Ippen, and H. I. Smith, “Microring-resonator-based add-drop filters in SiN: fabrication and analysis,” Opt. Express 12(7), 1437–1442 (2004). R. R. Krchnavek, G. R. Lalk, and D. H. Hartman, “Laser direct writing of channel waveguides using spin-on polymers,” J. Appl. Phys. 66(11), 5156–5160 (1989). L. Eldada, C. Xu, K. M. T. Stengel, L. W. Shacklette, and J. T. Yardley, “Laser-fabricated low-loss single-mode raised-rib waveguiding devices in polymers,” J. Lightwave Technol. 14(7), 1704–1713 (1996). M. Rosenberger, B. Schmauss, and R. Hellmann, “UV-writing of a superstructure waveguide Bragg grating in a planar polymer substrate,” Sensors 17(9), 1964 (2017). J. Missinne, A. Vasiliev, A. Elmogi, N. Teigell Beneitez, E. Bosman, B. Van Hoe, and G. Van Steenberge, “Bragg grating sensors in laser-written single mode polymer waveguides,” Procedia Eng. 120, 878–881 (2015). M. Svalgaard, “Direct writing of planar waveguide power splitters and directional couplers using a focused ultraviolet laser beam,” Electron. Lett. 33(20), 1694–1695 (1997). G. D. Marshall, P. Dekker, M. Ams, J. A. Piper, and M. J. Withford, “Directly written monolithic waveguide laser incorporating a distributed feedback waveguide-Bragg grating,” Opt. Lett. 33(9), 956–958 (2008). S. Pelli, G. C. Righini, A. Scaglione, M. Guglielmi, and A. Martucci, “Direct laser writing of ridge optical waveguides in silica-titania glass sol-gel films,” Opt. Mater. 5(1-2), 119–126 (1996). M. Svalgaard, C. V. Poulsen, A. Bjarklev, and O. Poulsen, “Direct UV writing of buried single mode channel waveguides in Ge-doped silica films,” Electron. Lett. 30(17), 1401–1403 (1994). E. Zgraggen, I. Murat Soganci, F. Horst, A. La Porta, R. Dangel, B. J. Offrein, S. A. Snow, J. K. Young, B. W. Swatowski, C. M. Amb, O. Scholder, R. Broennimann, U. Sennhauser, and G.-L. Bona, “Laser direct writing of single-mode polysiloxane optical waveguides and devices,” J. Lightwave Technol. 32(17), 3036–3042 (2014). G. D. Marshall, M. Ams, and M. J. Withford, “Direct laser written waveguide-Bragg gratings in bulk fused silica,” Opt. Lett. 31(18), 2690–2691 (2006). M. Dubov, S. R. Natarajan, J. A. R. Williams, and I. Bennion, “Mask-less lithography for fabrication of optical waveguides,” Proc. SPIE 6881, 688110 (2008). V. Vaidyanathan and S. Wang, “A maskless fabrication approach of integrated optical waveguides for engineering technology students,” presented at the American Society for Engineering Education Annual Conference & Exposition, Chicago, Illinois, 18–21 June 2006. J. C. Dingeldein, Direct Write Fabrication of Waveguides and Interconnects for Optical Printed Wiring Boards (Ph.D. Thesis, Michigan Technological University, 2012). K. Kruse and C. Middlebrook, “Laser-direct writing of single mode and multi-mode polymer step index waveguide structures for optical backplanes and interconnection assemblies,” Photonics Nanostruct. Fundam. Appl. 13, 66–73 (2015). H. Hartwig, E. Sergeeva, N. Thomas, and D. Hohlfeld, “Precision laser direct writing of polymer optical waveguides and optofluidic systems,” in DGaO Proceedings (The German Branch of the European Optical Society, 2016), A16. M. Belt, M. L. Davenport, J. E. Bowers, and D. J. Blumenthal, “Ultra-low-loss Ta2O5-core/SiO2-clad planar waveguides on Si substrates,” Optica 4(5), 532–536 (2017). K. Wörhoff, J. D. B. Bradley, F. Ay, D. Geskus, T. P. Blauwendraat, and M. Pollnau, “Reliable low-cost fabrication of low-loss Al2O3:Er3+ waveguides with 5.4-dB optical gain,” IEEE J. Quantum Electron. 45(5), 454–461 (2009). S. A. Vázquez-Córdova, M. Dijkstra, E. H. Bernhardi, F. Ay, K. Wörhoff, J. L. Herek, S. M. García-Blanco, and M. Pollnau, “Erbium-doped spiral amplifiers with 20 dB of net gain on silicon,” Opt. Express 22(21), 25993–26004 (2014). J. F. Bauters, M. J. R. Heck, D. D. John, M.-C. Tien, W. Li, J. S. Barton, D. J. Blumenthal, J. E. Bowers, A. Leinse, and R. G. Heideman, “Ultra-low-loss single-mode Si3N4 waveguides with 0.7 dB/m propagation loss,” in 37th European Conference and Exposition on Optical Communications, OSA Technical Digest, OSA Technical Digest (CD) (Optical Society of America, 2011), paper Th.12.LeSaleve.3. 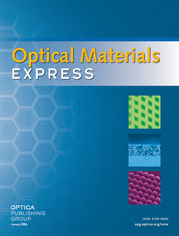 G. C. Righini and A. Chiappini, “Glass optical waveguides: a review of fabrication techniques,” Opt. Eng. 53(7), 071819 (2014). A. Kiani, K. Venkatakrishnan, B. Tan, and V. Venkataramanan, “Maskless lithography using silicon oxide etch- stop layer induced by megahertz repetition femtosecond laser pulses,” Opt. Express 19(11), 10834–10842 (2011). Y. Zhang, S. Yang, H. Guan, A. E.-J. Lim, G.-Q. Lo, P. Magill, T. Baehr-Jones, and M. Hochberg, “Sagnac loop mirror and micro-ring based laser cavity for silicon-on-insulator,” Opt. Express 22(15), 17872–17879 (2014). Fig. 1. Diagram of the UV laser write system showing lateral UV light scattering during exposure of negative photoresist. The quoted system minimum feature size is 0.9 µm with 120 σ nm edge roughness, an estimated write speed of 5 mm2/minute, and output powers of 0–70 mW at 375 nm. The maximum substrate diameter is 10 cm. Fig. 2. (a) Various widths of exposed and developed negative photoresist on Si3N4 films on thermally-oxidized silicon substrates. Features at narrow designed widths and lower energies demonstrate the x-y limitations of the stage’s mechanical motion. (b) Resist feature cross section for 0.45 µm designed width exposed using only y-axis of stage motion at 70 mW. (c) Resist feature cross section for 0.65 µm designed width exposed using both x-y stage motion at 70 mW. Fig. 3. (a) Measured widths vs. designed width for photoresist features exposed at various laser diode powers. Inset: SEM of the 60 mW exposed set of features. (b) Calculated edge roughness vs. designed width exposed at various laser diode powers. Inset: SEM of resist feature for 0.8 µm designed width and 60 mW exposure power. Fig. 4. Si3N4 waveguide fabrication steps and calculated electric field profile of the fundamental TE mode at 1550 nm for a 1.6 µm × 0.1 µm Si3N4 strip waveguide. Fig. 5. (a) Various fabricated Si3N4 waveguides with increasing width and gap demonstrating gap resolution at 70 mW exposure power. (b) Final fabricated Si3N4 waveguide cross section for a 0.7 µm designed width waveguide fabricated using 70 mW UV laser power. (c) Parallel fabricated waveguides in a coupler region for 0.7 µm designed widths at 70 mW with a designed gap of 5 µm. Fig. 6. Measured gaps between fabricated waveguides of varying designed widths at 60 and 70 mW exposure powers. The measured waveguide widths are 2.1–2.8, 2.9–3.3 and 3.3–3.9 µm at 60 mW and 3.0–3.6, 3.4–4.1 and 4.1–4.7 µm at 70 mW for 0.7, 0.8 and 1.0 µm designed widths, respectively. Inset SEM image of waveguides with 1.0 and 7.0–6.2 µm designed width and gap respectively, with 70 mW exposure power. Fig. 7. SEM images of total footprint (bottom) and coupling regions (top) for Si3N4 integrated optical devices fabricated using UV laser resist mask patterning. (i) 300-µm-radius Sagnac loop interferometer with 40 µm coupling length and with (w) and gap (g) of 1.9 and 1.1 µm respectively. (ii) Directional coupler with 40 µm coupling length and fabricated w and g of 1.1 and 2.1 µm respectively. (iii) 300-µm-radius point coupled ring resonator with w and g of 1.6 and 1.5 µm respectively. Fig. 8. Transmission spectra for Si3N4 integrated optical devices fabricated using UV laser resist mask patterning. (a) Directional coupler showing 50/50 coupling at 1510 nm for 40 µm coupling length. (b) 300-µm-radius Sagnac loop interferometer with repeated coupler length, demonstrating a 20 dB extinction ratio at ∼1580 nm (c) 300-µm-radius point coupled ring resonator. (d) Lorentzian resonance fit demonstrating a Q of 12,980 at 1576.2 nm.